A QR code may link to an email address, a website or a variety of other destinations, but or this project, the QR codes shown next to objects link to pages on the “Tales of Things” website that are dedicated to the objects that you’re looking at. What the “Tales of Things” website offers you is the chance to comment on the object that you’re looking at. You will find that one of the Petrie curators has added some information to the web page and you can either reply to that or add your own thoughts. As “Tales of Things” is a three-year project designed to help researchers to understand what objects of all ages and types mean to people, those of us who respond to an objects on the “Tales” site are an essential part of their research. 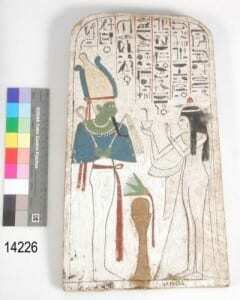 I used the free-of-charge QR reader on my iPhone to read the QR code for Petrie Museum stela of Neskhons (UC14226). The QR code directed my phone to link me to the “Tales of Things” website, and there (having already registered earlier in the day) I was able to read a short description of the object and, most excitingly, leave my own thoughts about it. My comment represents neither the greatest piece of English (my second sentence makes my own head spin), nor the greatest insight into Pharaonic art, but it was done in a bit of a rush and it was simply great to see how quickly it all worked. My somewhat hurried thoughts on UC14226 are now there for the world to see and, should they wish to, respond to. To see the original entry and my comment on it, just go to http://talesofthings.com/totem/totem_view/566/ and click on the orange “stelae” link in the pale blue bar near the bottom of the page. Being asked to respond to an object of whatever age, shape or subject, does challenge you to think more creatively than when you are just passing objects that don’t reach out and ask you to react. Even if you don’t actually go through the process of using the QR code to link to the site and leave your comment, the very act of being asked a question invites and encourages a coherent response. If you are in the Petrie you are probably the sort of person who forms relationships with the items on display. “Tales of Things” asks you to makes that relationship explicit by challenging you, very charmingly, to put your feelings into words. And somehow, even if you never take your phone out of your pocket, you find yourself putting your responses into words in your head. This is an intriguing and inventive way of encouraging visitors think about objects and how we respond to them. If you would like to participate during your museum visit you will need to do a couple of things before you go. First, you will need a smartphone or tablet and download a QR reader onto it. There are many QR readers available for download free of charge. You will also need to register on the “Tales of Things” site at http://www.talesofthings.com (a two-minute job and all you need to do is register a username and password). 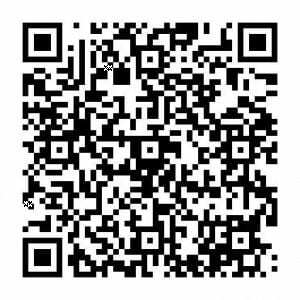 Once you are registered with “Tales” and have your QR reader you are ready to go. If you don’t have the opportunity to visit the museum or don’t have a smartphone or iPad you can still participate at home using an ordinary PC. Just go to the “Tales of Things” website and register your username and password. Then you will be able to comment on items that Petrie curators have saved to the site. Just type “Petrie” into the search engine and you will see the Museum’s contributions to the project. This is a great opportunity to both get a feel for the new technologies that are being implemented in museums today, and to contribute to some valuable research about how people respond to objects. Enjoy! Good way to use QR codes to teach people about history. If you use a QR code system such as. http://www.zumoqr.com to create QR codes, you can change the link on the QR codes and thereby teach people different stories from the same QR code – I can definitely recommend zumoQR to everyone who are using QR codes to education, training, learning, etc.